Remove and replace entire concrete overpass deck including the installation of concrete, formwork, reinforcing bars, waterproofing, and aphalt topping section, and repair tunnel walls. Remove and reinstall, or protect in place, utilities mounted to the underside of the slab, including, but not limited to: light fixtures, conduit, cameras, sprinkler pipes, pipes remove and replace all deteriorated and chloride contaminated concrete slab/deck in the areas noted on the plans. Perform vertical concrete wall patch repairs and crack injection on the overpass walls, in the tunnel. Replace concrete slab/deck, including formwork and steel reinforcing bars. Provide a waterproofing membrane on the concrete slab/deck prior to asphalt topping. Install new asphalt pavement topping. Remove and replace entire concrete deck including the installation of concrete, formwork, reinforcing bars, waterproofing, and Asphalt topping section, and repair tunnel walls. Remove and reinstall, or protect in place, utilities mounted to the partial depth repair to underside of the slab, including, but not limited to: light fixtures, conduit, cameras, sprinkler pipes, pipes remove and replace all deteriorated and chloride contaminated concrete slab/deck in the areas noted on the plans. Perform vertical concrete wall patch repairs and crack injection on the walls, in the garage. Replace concrete slab/deck, including formwork and steel reinforcing bars. Provide a waterproofing Traffic bearing membrane on the concrete slab. Grating and Trench Cover Replacement, and Replace Blow down Pipe throughout basement in trench. The contract involved replacing the Trench Cover Plates as well as portions of the Grating covering the Sub-Basement. Portions of the old covers are warped and the grating is unstable and presents a safety risk for those that walk over them. Replace Trench Grating throughout the basement with specified materials according to design 1300 s.f. of steel checkered plate Various thicknesses and reinforcement, 250 s.f. of steel bar grating, repaired 1700 l.f. of Trench Lining, Repair concrete portions of floor specified. In addition to General Concrete repairs for specified portions of the basement. Remove and replace over 380 linear feet of Schedule 80, 4” an 6”blowdown piping located inside the trench. Construction of the Mechanical Pad and installation of the Chemical Shed onto new concrete pad. The project involved the removal of a deteriorated timber bulkhead from within and along the edges of the lake and replacing same with a Pre-cast Stone bulkhead and pavers. Work included a new timber trellis, paving and re-landscaping disturbed areas. Water control was required to a depth of 6 feet and a length of 100 feet resulted in 24/7 dewatering operation. Greenbridge provided the jobsite supervision and workforce for the day-to-day activities reported to the project manager. Greenbridge assisted in the installation of the temporary 8’ x100’ water filled cofferdam, maintained the continuous dewatering of the construction area, installed over 500ft long by 11 ft high precast stone bulkhead with over 120 tons of gravel with geo-grid for structural support, rebuild banks with class-2 & 3 rip-rap, grade sediment in the dewatered lakebed. Installed 1500 lf of 5ft wide asphalt sidewalk, landscaped and reworked 7 acres of landscaping in the limits of construction area witch included grading, seeding, mulching, and planting of trees and shrubs, underwater construction of 48” concrete culvert wall. Remove old rapid roll up doors to the Loading dock, and install new automatic doors. Remove all old egress doors and frames in basement Vestibules and replace with new Automatic doors and operators. The contract involved removal, disposal of old existing doors and frames along with existing operators and associated hardware, fabricate and weld to existing rough opening of vestibules, install new doors and finished hardware, furnish and install automatic operators with motion sensors, HC push pads, paint all doors and frames. Sidewalk Replacement at the student drop off area and the Installation of Canopy Drainage Systems at New Town High School. The scope of work consisted of removal, disposal and replacement of approximately ninety foot of curb and gutter, 2200 sq ft at 10” thick of sidewalk, and the installation of drainage systems for the canopies over the exterior doors to channel water away from the sidewalk area, install four 4” PVC drain tile prior to pouring new sidewalk at the student drop off area. Install 14 steel bollards placed 5’ on center and 42” high, all work in accordance to ADA compliant to make new entrance handicap accessible. Furnish Material and Labor to install three Pair Post office grade Impact Doors leading to alley, for all openings per scope of work Remove all old egress doors and frames in basement Vestibules and replace with new Doors. The contract involved removal, disposal of old existing doors and frames along with existing operators and associated hardware, fabricate and weld to existing rough openings as needed, install new doors and finished hardware. Boiler Structural Concrete Platform repair Remove and replace entire concrete deck around boilers 1-6 including the installation of concrete, formwork, reinforcing bars, Lead and asbestos abatement, and restoration of catwalk structure and grating, repair steel structural columns and support beams. Remove and reinstall, or protect in place, utilities mounted to the underside of the slab, and associated painting, Including, but not limited to: light fixtures, conduit, cameras, sprinkler pipes, pipes remove and replace all deteriorated and chloride Contaminated concrete slab/deck in the areas noted on the plans. Perform vertical concrete wall patch repairs. Install new flooring for Finish surface. Remove 12 plaster soffit panels at D building, install new framing system for soffit, place 7/8” of underside stucco. Repair and fix associated electrical wires and recessed lighting. Structural Concrete Overpass Construction Repair Project. Remove and replace entire concrete overpass deck including the installation of concrete, formwork, reinforcing bars, waterproofing, and Asphalt topping section, and Partial depth repair tunnel walls. Remove and reinstall, or protect in place, utilities mounted to the underside of the slab, including, but not limited to: light fixtures, conduit, cameras, sprinkler pipes, pipes remove and replace all deteriorated and chloride contaminated concrete slab/deck in the areas noted on the plans. Perform vertical concrete wall patch repairs and crack injection on the overpass walls, in the tunnel. Replace concrete slab/deck, including formwork and steel reinforcing bars. Provide a waterproofing membrane on the concrete slab/deck prior to asphalt topping. Install new asphalt pavement topping. Boiler Structural Concrete Platform repair Remove and replace entire concrete deck around boilers 1-6 including the installation of concrete, formwork, reinforcing bars, Lead and asbestos abatement, and restoration of catwalk structure and grating, repair steel structural columns and support beams. Remove and reinstall, or protect in place, utilities mounted to the underside of the slab, and associated painting, Including, but not limited to: light fixtures, conduit, cameras, sprinkler pipes, pipes remove and replace all deteriorated and chloride Contaminated concrete slab/deck in the areas noted on the plans. Perform vertical concrete wall patch repairs. Install new flooring for Finish surface. Emergency Replacement of Bridge No. 08036 on MD 234 over Allens Fresh Run. 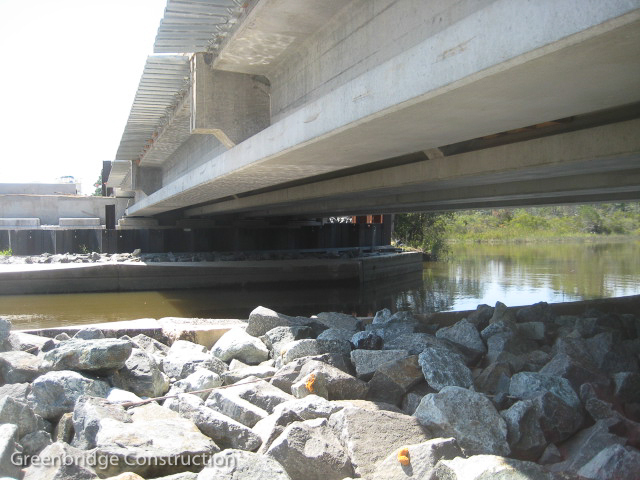 Single span precast prestressed concrete beam bridge will be 91’ long with a 56’ clear roadway. Project includes removal and loading for shipment of the existing temporary Acrow bridge, 0.407 miles of approach roadway work, placement of new traffic barriers, permanent pavement striping and signing, and final landscaping of the site. Two-way traffic will be maintained during construction. Remove section of elevated slab off fourth floor, form and repair steel reinforcement, form and pour new slab. Fire Main upgrade at OPM. 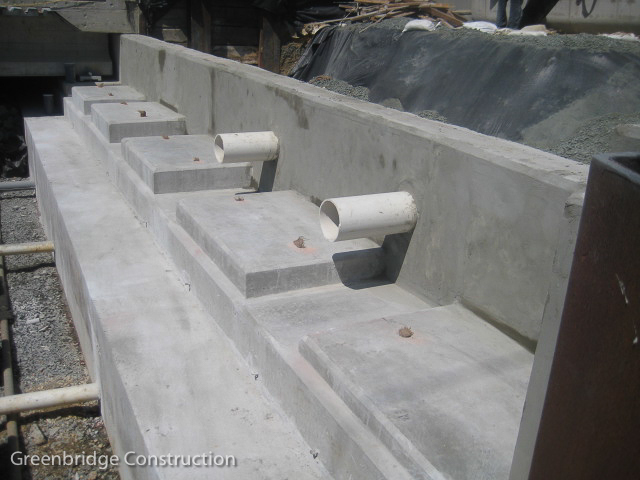 Design build repair project of existing fire water system for the Office of personnel. Current system failed fire test (did not meet 150% flow) Once design was completed and approved, Remove existing 19th street side fire main lines and install new, remove and replace 20th street fire main line and domestic line. Mechanical rework of valves in vaults. This work consisted of concrete demo and replacement, Asphalt removal and replacement (street work), interior demo and replacement of office spaces affected, landscaping, sidewalks. Test lines and achieved 150 plus flow rate for 20th and 19th street mains.